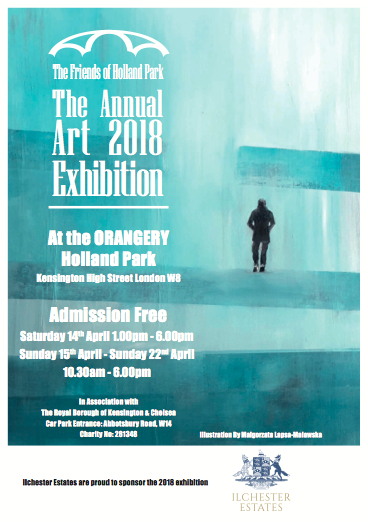 The Friends of Holland Park Annual Art exhibition looks back on a long tradition of showcasing the work of Friends who are artists to other Friends and the general public, in the beautiful surroundings of The Holland Park Orangery. Works by around 75 artists range from paintings, drawings and photographs to sculpture and ceramics. The Friends of Holland Park is a registered charity and proceeds generated from sales will benefit the conservation of historic assets and the protection of wildlife in this unique oasis. As this year’s Feature Artist Malgorzata Lapsa-Malawska follows in the footsteps of botanical artist Olivia Chalmers (2017), Chinese painter Mao Wen Biao (2016), former Arts Council and National Trust director Sir Angus Stirling (2015) and the late Sir Hugh Casson (2014). As an experienced project manager with solid credentials in international marketing and communications, I established factor-m to provide guidance and support to creative individuals in most disciplines and at any stage in their professional development. Transparency and integrity constitute the core of my approach which is individually tailored to each client. With a head for figures and a passion for the arts I aim to bring together people, business and culture. factor-m provides essential consulting services for artists, musicians or designers seeking to improve efficiency and to achieve set goals.